This card is a follow up to the previous post, done as a promo for the Magic: the Gathering Theros release. 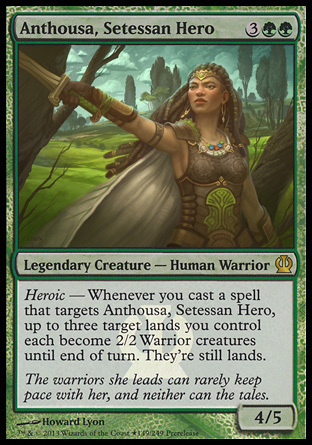 Another depiction of Anthousa, Setessan Hero. I really enjoyed the landscape in the background on this painting. It was fun to stylize the clouds and use the clusters of trees to create some large shapes. Trees are pretty darn useful to create large movement in a painting as are hair and cloth. Here they all work together to create a large swipe diagonally through the painting. This is contrasted by the diagonal of her arm running against that movement to the upper left hand corner. This is a common composition that was employed over and over by artists like Caravaggio, Rubens, and many other old masters. Here is a shot of the painting with the main composition lines highlighted. The red lines are the primary diagonals. The blue line is the contrasting movement. 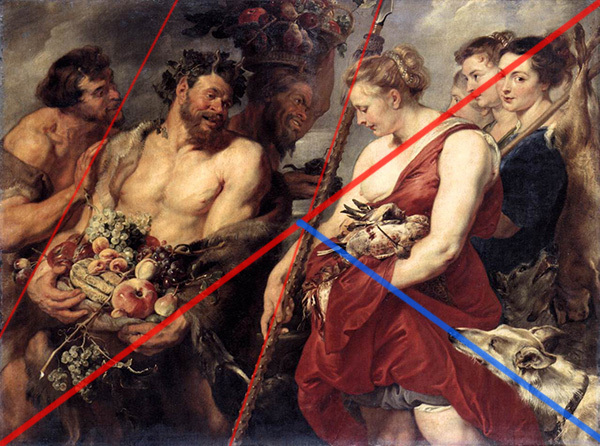 And here are some old master paintings with the same compositional lines. Of course my piece is much simpler, but still related as far as the design goes. One of my illustrations for the Magic: the Gathering - Theros release. Lots of fun painting the minotaurs here. I enjoyed working in small temperature shifts, cooling down their extremities and where the skin is thinner or more blood circulates. Check back tomorrow to see the companion piece to this one. An Wizards ended up using this painting as the box art and cover card for the Theros intro pack. Cool!